Infection by human CMV induces expression of the cellular MHC class I-related chain A (MICA) and chain B (MICB) surface proteins, which function as ligands for the activating NKG2D receptor. Engagement of NKG2D triggers NK cells and costimulates Ag-specific effector CD8 αβ T cells. The potency of MHC class I-related chain-NKG2D in stimulating these anti-viral immune responses may be countered by a CMV-encoded transmembrane glycoprotein, UL16, which specifically binds MICB as well as two of the UL16-binding proteins that are ligands of NKG2D. However, the function and significance of these interactions are undefined. Using a stably transfected B cell line, we show that expression of UL16 results in loss of surface MICB. This effect is caused by the failure of newly synthesized MICB to mature and transit the secretory pathway due to physical association with UL16. The intracellular retention of these protein complexes is mediated by a tyrosine-based motif in the cytoplasmic tail sequence of UL16, which determines localization to or retrieval from the trans-Golgi network. Deletion of this motif restores surface expression of MICB, whereas UL16 may be redirected to endosomal compartments. Predictably, the retention of MICB abrogates the stimulatory function of NKG2D. These results suggest a potential mechanism of viral immune evasion. However, this activity remains to be confirmed with CMV-infected fibroblasts or endothelial cells, in particular because MICB is normally coexpressed with MICA, which is not retained by UL16. The existence of numerous specific interactions between viral proteins and molecules of the immune system reflects the intense evolutionary pressure imposed on host-pathogen relationships (1, 2). Usually, these constitute a balance between viral escape from immune control and the host defense limiting virus spread and resultant disease. Human CMV persists lifelong in a latent state with asymptomatic episodes of virus shedding. Only in immunocompromised individuals, virus reactivation results in severe disease manifestations (3, 4). To maintain long-term persistence in infected hosts, CMV interferes with several stages of Ag processing and presentation by MHC class I molecules, thus compromising the ability of CD8 αβ T cells to eliminate infected cells. The CMV US6 membrane protein impairs the function of TAP, which delivers peptides derived from proteasomal protein degradation into the endoplasmic reticulum (ER)3 for selective binding by MHC class I molecules. The US3 protein retains class I molecules in the ER, and US2 and US11 redirect nascent class I chains back into the cytosol where they are degraded (1, 2, 3). Counteracting these strategies of immune evasion, CMV-infected fibroblast or endothelial cells induce expression of stress-regulated cell surface proteins, the MHC class I-related chain A (MICA) and chain B (MICB) molecules (5, 6). These molecules have no role in Ag presentation but function as ligands for the activating NKG2D receptor, which costimulates CD8 αβ T cell cytotoxicity, proliferation, and cytokine secretion (6, 7, 8). At least in vitro, triggering of NKG2D augments anti-CMV CD8 αβ T cell responses, thus overcoming the viral interference with Ag presentation (6). However, as with MHC class I molecules, CMV may have the ability to obstruct the function of NKG2D ligands, which include a set of three UL16-binding proteins (ULBP) that share no direct relationship with MHC class I-related chains (MIC), but have MHC class I-like extracellular α1α2 domains (9). Binding studies utilizing recombinant IgG Fc region fusion proteins have revealed that the CMV UL16 transmembrane glycoprotein, which was of unknown function, specifically interacts with MICB and ULBP1 and ULBP2, but not with MICA and ULBP3 (9). This raises the question of the physiological significance of UL16, specifically, whether and how it may impair the function of NKG2D ligands and the immunological consequences thereof. We have studied the interaction of UL16 with MICB because the tissue distribution and regulation of the ULBP proteins and thus their significance in CMV infections are less well defined. Using a stably transfected B cell line, we show that UL16 retains MICB in the ER via localization to or retrieval from the trans-Golgi network (TGN), thus abrogating its cell surface expression. As a result, NKG2D-dependent costimulation of CMV-specific T cell responses is impaired. However, as implied by previous results obtained with CMV-infected fibroblast and endothelial cells, this potential means of viral evasion is bypassed by MICA, which is not bound by UL16. Human fibroblasts immortalized with amphitropic retrovirus expressing telomerase (10) were grown in Waymouths medium (Life Technologies, Gaithersburg, MD) supplemented with 10% FCS and standard antibiotics. C1R B cell transfectants were grown in RPMI 1640 with 10% FBS under G418 (1.5 mg/ml) selection. CMV strain AD169 was from the American Type Culture Collection (ATCC, Manassas, VA). The anti-MIC mAb 6D4 has been described (11). W6/32 and MA2.1 are mAbs specific for MHC class I and HLA-A2, respectively (12, 13). Anti-FLAG tag mAb M2, and anti-trans-Golgi p230 and anti-Lamp-1 were from Sigma-Aldrich (St. Louis, MO) and BD PharMingen (San Diego, CA), respectively. The mAb human UL16-M230 is specific for UL16 and stains cell surface-associated UL16 mutant proteins (D. Cosman, unpublished data). PE-conjugated anti-nerve growth factor receptor (NGFR) mAb was from Chromaprobe (Aptos, CA), and secondary Ab reagents were from BioSource International (Camarillo, CA) if not specified otherwise. The pCMX construct for expression of UL16 was derived from the retroviral LZRSpBMN-Z vector, which contains the puromycin resistance gene (14), by replacing the XhoI-EcoRI lacZ fragment with a XhoI-EcoRI cDNA fragment encoding a truncated human NGFR (ΔNGFR) (15). A CMV promoter followed by a polylinker with unique HindIII and NotI sites was inserted between the ΔNGFR cDNA and the 3′ long-terminal repeat. Full-length UL16 cDNA (9) was fused at the 3′ end to the sequence for the eight amino acid (DYKDDDDK) FLAG tag M2 Ab epitope by PCR as described (16). The purified amplicon, termed UL16FLN, was subcloned into PCR2.1 (Invitrogen, San Diego, CA), confirmed error-free by sequencing and inserted into pCMX between the HindIII and NotI sites. The UL16 3′ end deletion mutants were similarly generated by PCR using the oligonucleotide primers 5′-GAGTCGACGATATCATGGA-3′ (UL16 5′ end), 5′-AGCGGCCGCTACTATCGATGCGGCAGGCGAAT-3′ (UL16 m1 3′ end), and 5′-AGCGGCCGCTACTACTGGTATCGATGCGGCAGGCGAAT-3′ (UL16 m2 3′ end). As with full-length UL16, the mutant amplicons were sequenced and inserted into pCMX. UL16 wild-type and mutant constructs were transfected into C1R-MICB cells by electroporation as described (5), and stable transfectants were selected with puromycin (1 μg/ml) and screened with anti-NGFR mAb by flow cytometry. Transfectants expressing HLA-A2 cDNA in pREP8 (Invitrogen) were obtained after electroporation and selection with histidinol (2.5 mM). When necessary, positive transfectants were enriched by flow sorting. Cells were incubated with specific primary Ab, washed, and stained with fluorochrome-conjugated secondary reagents. For intracellular stainings, cells were fixed with 1% paraformaldehyde and permeabilized with 0.1% saponin before Ab stainings. Cells were analyzed using a FACScan cytometer and CellQuest software (BD PharMingen). C1R-MICB and C1R-MICB-UL16 transfectants were labeled with [35S]methionine (0.5 mCi/107 cells) in 1 ml methionine-free RPMI 1640 medium supplemented with 10% FCS for 7 min. For chase, 10-fold excess methionine was added and cells were pelleted at the indicated time points. After washes with cold PBS, cells were lysed in cold lysis buffer (1% Triton X-100, 10 mM CaCl2, 5 mM iodoacetamide, and protease inhibitors). Cleared lysates were preabsorbed with protein A/G-agarose (Pierce, Rockford, IL) and incubated with anti-MIC mAb 6D4. Immunocomplexes were collected with ultra-link protein A/G-agarose and washed with lysis buffer. Endoglycosidase H (Endo H; New England Biolabs, Beverly, MA) digestions were carried out overnight at 37°C. Proteins were separated by SDS-PAGE, transferred onto nitrocellulose membrane, and exposed to Kodak BioMax MR film. In the coprecipitation experiment, metabolically labeled C1R-MICB-UL16FLN cells were lysed in 0.5% digitonin and incubated with anti-MIC mAb 6D4. One-half of the immunocomplexes was processed for SDS-PAGE as above. The other half (10 μl beads) was suspended in 100 μl Triton X-100 lysis buffer to dissociate protein complexes and reprecipitated with anti-FLAG tag mAb M2 before isolation of immunocomplexes and SDS-PAGE. Fibroblasts (XG line) cultured on chamber well slides were infected with CMV AD169 at a MOI of 5. After 48 h, cells were fixed with cold acetone/methanol (1:1), blocked with 20% normal goat serum and incubated with anti-UL16 mAb or matched isotype control. After rinsing with PBS, cells were stained with biotinylated goat anti-mouse F(ab′)2 Ig (Jackson ImmunoResearch Laboratories, West Grove, PA) and Streptavidin Alex594 (Molecular Probes, Eugene, OR). For dual stainings, cells were blocked using avidin-biotin blocking kit (Vector Laboratories, Burlingame, CA) and incubated with anti-p230 or anti-Lamp-1 mAbs before staining with the biotinylated anti-mouse reagent and Streptavidin Alex488 (Molecular Probes). Nuclei were counterstained with 4′,6′-diamidino-2-phenylindole (5 μg/ml; Sigma-Aldrich). Slides were examined using a Delta Vision system (Applied Precision, Issaquah, WA). Human 293T embryonic kidney cells (ATCC) transfected with MICB and UL16 or UL16 m1 expression constructs using LipofectAMINE reagent (Life Technologies) were treated identically for stainings. The CMV pp65-specific HLA-A2-restricted T cell clone ER1A3-3 (S. R. Riddell, unpublished data) was generated and maintained as described (17). Standard 4-h cytotoxicity assays with [51Cr]sodium chromate-labeled target C1R-A2, C1R-A2-MICB, and C1R-A2-MICB-UL16 transfectants pulsed with titered concentrations of the specific pp65 NLVPMVATV peptide and the IFN-γ and TNF-α release assays were carried out as described (6). The previously observed specific binding of soluble recombinant UL16-IgG Fc region fusion protein to MICB raised the question of whether the viral gene product may interfere with NKG2D-mediated T cell costimulation, either by intracellular retention or by surface masking of MICB. These possibilities were investigated by expression of UL16 in C1R-MICB B cell transfectants. Because the cellular localization of UL16 was unknown, we used a retroviral DNA construct that included sequences for a ΔNGFR as a reporter facilitating flow cytometry analysis and sorting of UL16 positive cells (see Materials and Methods). With stable transfectant isolates that were positive for surface NGFR, expression of UL16 was confirmed by RNA blot hybridization and immunoblotting. As determined by Ab staining and flow cytometry, UL16 was absent from the surfaces of transfected cells and of fibroblasts infected with CMV (data not shown). Expression of UL16 in the C1R transfectants resulted in loss of surface MICB, whereas MHC class I was unaltered (Fig. 1⇓A). However, staining of permeabilized C1R-MICB-UL16 cells showed that the total cellular amounts of MICB were unchanged, suggesting that UL16 caused intracellular retention of MICB (Fig. 1⇓B). UL16 had no effect on the expression of various alleles of MICA, in accord with the previously observed lack of binding (Ref. 9 and data not shown). 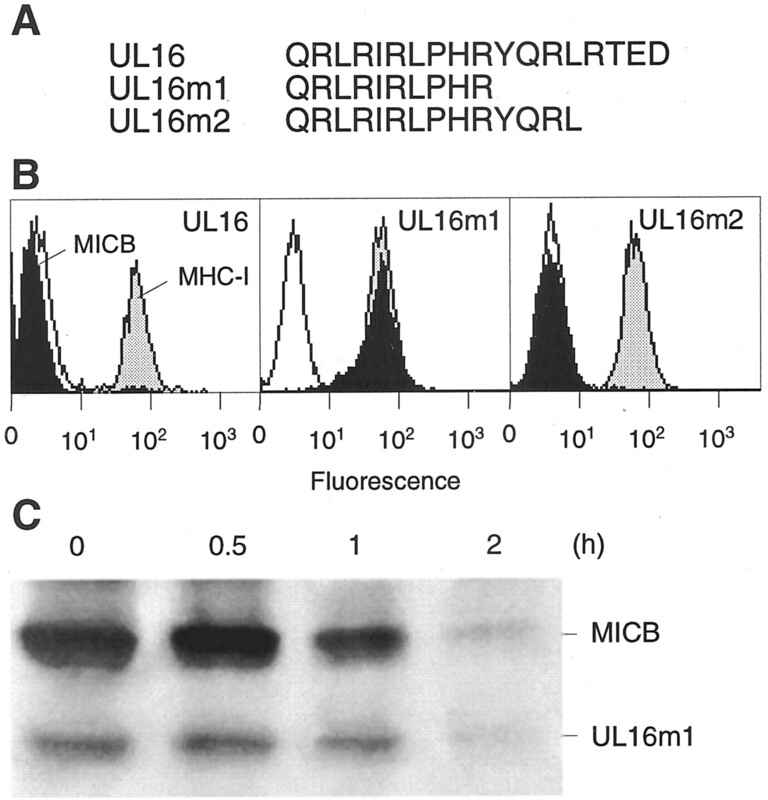 Expression of UL16 impairs surface expression of MICB. 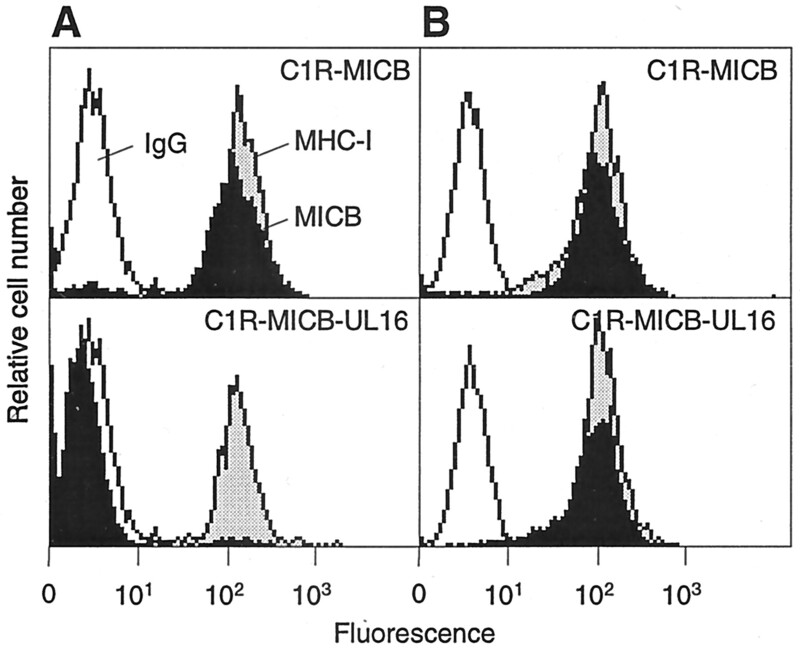 A, Stable expression of UL16 abrogates surface MICB on transfectants of C1R cells (bottom panel) as compared with C1R-MICB cells lacking UL16 (top panel). B, The intracellular amounts of MICB measured by staining of permeabilized C1R-MICB and C1R-MICB-UL16 cells are unchanged, indicating normal biosynthesis and absence of rapid degradation. To examine the fate of MICB in C1R transfectants expressing UL16, we performed metabolic pulse-labeling and chase experiments in which MICB was immunoprecipitated with mAb 6D4 from lysates of cell aliquots withdrawn at various time points during the chase and treated with Endo H before analysis by SDS-PAGE. This procedure provides a quantitative and kinetic measure of protein transport through the medial Golgi where Endo H-sensitive high mannose is processed to Endo H-resistant complex-type carbohydrate. Throughout the 2-h chase, virtually all of the newly biosynthesized MICB protein remained Endo H-sensitive (Fig. 2⇓A). After 8 h of chase, the amount of immature MICB was reduced to ∼50%, presumably due to progressive degradation (data not shown). By contrast, in control experiments with transfectants lacking UL16, the conversion of MICB to Endo H-resistant forms was apparent after 1 h and nearly completed after 2 h of chase. Presumably because of heterogeneity among the nine N-linked carbohydrates of mature MICB, gel electrophoresis produced a diffuse smear in the 70–80 kDa range instead of a compact protein band (Fig. 2⇓B; Refs. 5 and18). Together, these results showed that MICB was retained in the ER or an early Golgi compartment and thus failed to transit the secretory pathway. Impaired maturation of MICB in association with UL16. A, Immunoprecipitations and SDS-PAGE after metabolic pulse-labeling and chase show lack of maturation of MICB in C1R-MICB-UL16 transfectants during the 2 h of the chase. B, Normal maturation of MICB in the absence of UL16, as indicated by the gradual disappearance of the Endo H-sensitive protein after 1 h of the chase, and its conversion to mature highly glycosylated forms within a 70–80 kDa molecular mass range (5 ,18 ). C, Immunoprecipitation of MICB from digitonin lysates of C1R-MICB-UL16 cells identifies a second protein band of ∼50 kDa that is absent in C1R-MICB cells. D, This band corresponds to UL16 as shown by secondary precipitation with the anti-FLAG tag mAb M2 of dissociated immunocomplexes in Triton X-100 lysis buffer. To directly implicate UL16 in the retention of MICB, it was necessary to demonstrate physical complexes of these molecules. In digitonin lysate of labeled C1R-MICB-UL16 cells, immunoprecipitation with the anti-MIC mAb 6D4 revealed a second band of ∼50 kDa that was absent in lysate of C1R-MICB cells (Fig. 2⇑C). This band was identified as UL16 after dissociation of protein complexes by addition of Triton X-100 buffer and secondary precipitation with mAb M2, which is specific for the FLAG tag epitope fused to the C terminus of the expressed recombinant UL16 (Fig. 2⇑D; see Materials and Methods). Thus, these results confirmed that the retention of MICB was caused by its physical interaction with UL16. UL16 is a predicted type 1 transmembrane glycoprotein. Inspection of its cytoplasmic tail sequences revealed a YQRL amino acid sequence motif that is known to mediate localization to or retrieval from the TGN of other proteins (19, 20). We tested a role of this motif in the localization of UL16 and the retention of MICB by expression of UL16 deletion mutants (Fig. 3⇓A). As with full-length UL16, C1R-MICB cells were stably transfected with C-terminal resections of the UL16 cDNA in the same expression construct and screened for surface NGFR. Expression of mutant UL16 was confirmed by RNA blot hybridization and immunoblotting (data not shown). Deletion of four amino acids (UL16 m2) excluding the YQRL motif did not affect intracellular MICB retention, but deletion of eight amino acids (UL16 m1) including this sequence restored surface MICB (Fig. 3⇓, A and B). Retention was mainly, if not exclusively, associated with the tyrosine residue in the YQRL motif, because deletion of arginine and leucine had no effect on MICB (data not shown). The restored surface expression of MICB corresponded with its maturation in association with the UL16 m1 mutant protein in a pulse-labeling and chase experiment showing the gradual disappearance of the newly synthesized immature glycoproteins (Fig. 3⇓C). Retention of UL16-MICB is dependent on a tyrosine-based cytoplasmic tail sequence motif. A, C-terminal amino acid sequence of UL16 and the UL16 m1 and UL16 m2 deletion mutants. B, Expression of UL16 m1 but not of UL16 m2 restores surface MICB, as shown by Ab staining and flow cytometry. C, Immunoprecipitations with anti-MIC mAb 6D4 from digitonin cell lysates after pulse-labeling and chase and SDS-PAGE show carbohydrate maturation of MICB-UL16 protein complexes as indicated by the gradual disappearance of the newly synthesized immature protein bands between 0.5 and 2 h of the chase (see Fig. 2⇑A for comparison with maturation of MICB coexpressed with wild-type UL16). None of the UL16 mutants were present in significant amounts at the cell surface as indicated by Ab stainings and flow cytometry (data not shown). We compared the cellular localizations of wild-type UL16 and the UL16 m1 mutant by Ab stainings of fixed and permeabilized cells and confocal microscopy. Immortalized fibroblasts (XG) infected with CMV AD169 showed a perinuclear reticulate staining of UL16 that was indistinguishable from the pattern seen after staining of the trans-Golgi p230 marker protein (Fig. 4⇓A). Similar observations were made with human 293T cell transfectants expressing MICB and UL16 (Fig. 4⇓B). Stainings of the C1R transfectants were not informative due to the large nuclei occupying most of the cytoplasm in these cells. These results confirmed that UL16-MICB complexes were retained by localization to or retrieval from the TGN. By contrast, the staining patterns of UL16 m1 and p230 appeared more distinct (Fig. 4⇓C). However, a similar peripheral distribution was observed by comparison of UL16 m1 with Lamp-1, suggesting that at least some of the mutant protein may be redirected to endosomal vesicles (Fig. 4⇓D). Localization of wild-type and mutant UL16 by confocal microscopy. A, CMV-infected fibroblasts (XG cells) stained for p230 and UL16 show identical perinuclear reticulate staining patterns. An overlay of these images is shown on the right. B, Similar results were obtained with 293T-MICB-UL16 transfectants. C, The staining patterns of UL16 m1 and p230 in 293T transfectants show large areas of non-overlap in the image at right, suggesting a distinct cellular localization of the mutant protein. 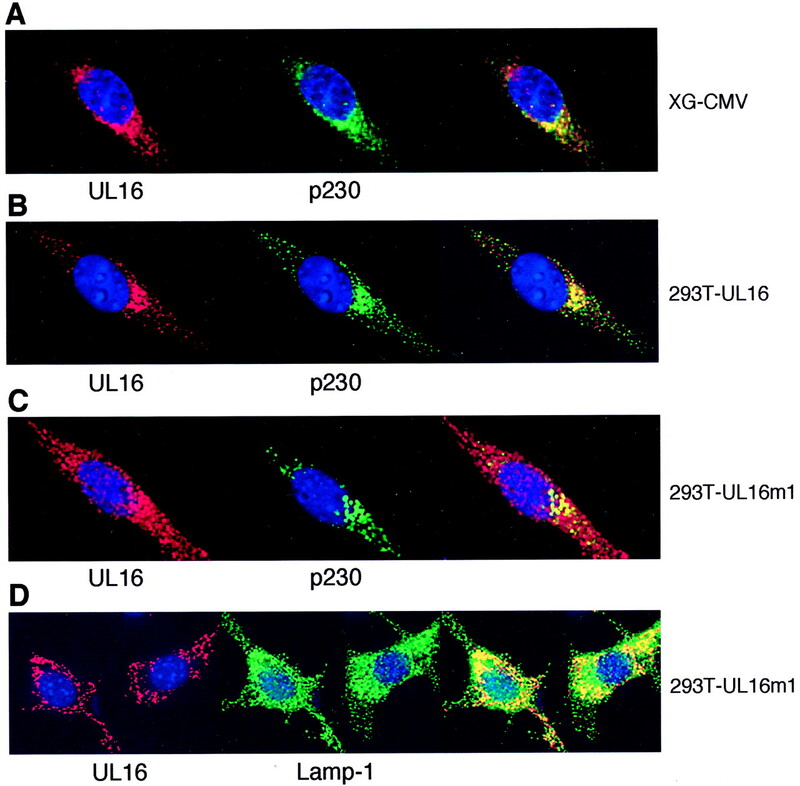 D, A similar peripheral staining pattern was observed for UL16 m1 and Lamp-1, suggesting an endosomal localization. A–D, Nuclei were counterstained with 4′,6′-diamidino-2-phenylindole (see Materials and Methods for further details). We investigated the functional effect of the interference of UL16 with MICB surface expression on T cell activation. C1R-MICB and C1R-MICB-UL16 cells stably transfected with a HLA-A2 cDNA construct were pulsed with titered concentrations of the CMV pp65 peptide and used as target and stimulator cells for the specific HLA-2-restricted CD8+CD28− αβ T cell clone ER 1A3-3 (Ref. 17 and S. R. Riddell, unpublished data). The results showed that under suboptimal peptide concentrations, T cell cytotoxicity declined more rapidly in the presence of UL16 (Fig. 5⇓A). Moreover, T cell production of IFN-γ, TNF-α, and IL-4 was substantially reduced, even at optimal concentrations of the antigenic peptide (Fig. 5⇓, B and C; data not shown). Thus, the UL16-mediated impairment of MICB expression had profoundly negative effects on T cell activation. UL16 impairs T cell costimulation by MICB-NKG2D. 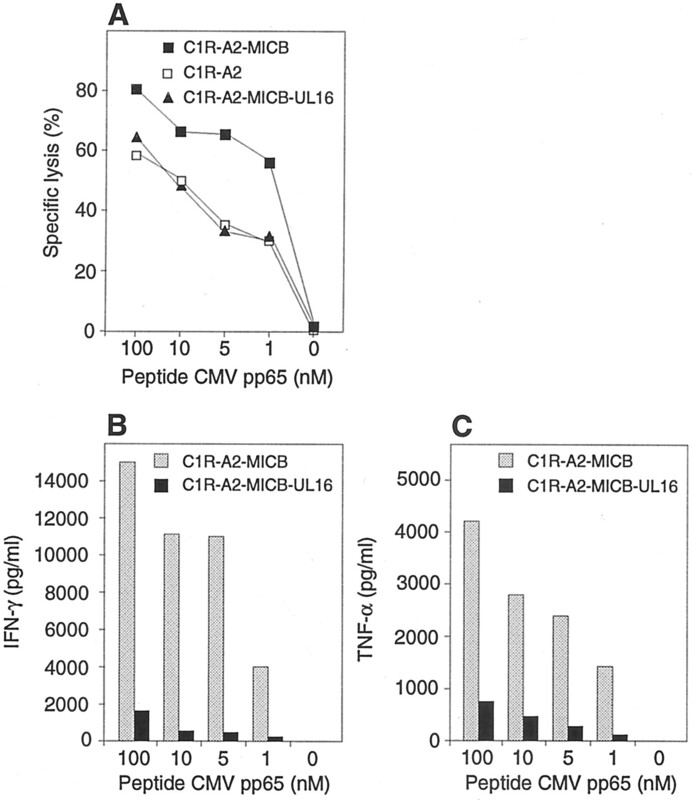 A, The cytolytic responses of the CMV pp65-specific and HLA-A2-restricted T cell clone ER 1A3-3 are similarly low against peptide-pulsed C1R-A2 and C1R-A2-MICB-UL16 transfectants, whereas the responses against identically treated C1R-A2-MICB transfectants are significantly higher. B and C, The costimulatory function of NKG2D as measured by T cell production of IFN-γ and TNF-α is abrogated by expression of UL16 in the peptide-pulsed stimulator cells. Data shown are representative of three independent experiments. The present study shows that the CMV UL16 protein interferes with the T cell activating function of NKG2D, by intracellular retention of its MICB ligand, thus potentially favoring viral immune evasion. However, because MICB has been studied in isolation, the triggering function of MICA, which is normally coexpressed with MICB and not retained by UL16, is not accounted for. This complex setting may also involve the ULBP proteins, depending on whether they are expressed in CMV-infected cells. Moreover, it is unlikely that the experimental expression of UL16 and MICB at high levels in the C1R B cell line replicates physiological conditions of CMV infections in relevant cell types and tissue microenvironments. Thus, although our results imply an immunomodulatory function of UL16, the evidence is not definitive. However, as is the case in other systems, UL16 probably contributes to subtle balances favoring viral evasion or T cell control that are influenced by many factors. We thank Max Topp for the ΔNGFR vector construct and Veronika Groh for virus and Abs. ↵1 This work was supported by Grants AI30581, AI52319, and CA18029 from the National Institutes of Health. ↵3 Abbreviations used in this paper: ER, endoplasmic reticulum; MIC, MHC class I-related chain; MICA, MIC chain A; MICB, MIC chain B; Endo H, endoglycosidase H; ULBP, UL16-binding proteins; TGN, trans-Golgi network; NGFR, nerve growth factor receptor. Ploegh, H. L.. 1998. Viral strategies of immune evasion. Science 280:248. Xu, X.-N., G. R. Screaton, A. J. McMichael. 2002. Virus infections: escape, resistance and counterattack. Immunity 15:867. Hengel, H., W. Brune, U. H. Koszinowski. 1998. Immune evasion by cytomegalovirus: survival strategies of a highly adapted opportunist. Trends Microbiol. 5:190. Sweet, C.. 1999. The pathogenicity of cytomegalovirus. FEMS Microbiol. Rev. 23:457. Groh, V., S. Bahram, S. Bauer, A. Herman, M. Beauchamp, T. Spies. 1996. Cell stress-regulated human major histocompatibility complex class I gene expressed in gastrointestinal epithelium. Proc. Natl. Acad. Sci. USA 93:12445. Groh, V., R. Rhinehart, J. Randolph-Habecker, M. S. Topp, S. R. Riddell, T. Spies. 2001. Costimulation of CD8 αβ T cells by NKG2D via engagement by MIC induced on virus-infected cells. Nat. Immun. 2:255. Bauer, S., V. Groh, J. Wu, A. Steinle, J. H. Phillips, L. L. Lanier, T. Spies. 1999. Activation of NK cells and T cells by NKG2D, a receptor for stress-inducible MICA. Science 285:727. Wu, J., Y. Song, A. B. H. Bakker, S. Bauer, T. Spies, L. L. Lanier, J. H. Phillips. 1999. An activating immunoreceptor complex formed by NKG2D and DAP10. Science 285:730. Cosman, D., J. Müllberg, C. L. Sutherland, W. Chin, R. Armitage, W. Fanslow, M. Kubin, N. J. Chalupny. 2001. ULBPs, novel MHC class I-related molecules, bind to CMV glycoprotein UL16 and stimulate NK cell cytotoxicity through the NKG2D receptor. Immunity 14:123. Ducray, C., J.-P. Pommier, L. Martins, F. D. Boussin, L. Sabatier. 1999. Telomer dynamics, end-to-end fusions and telomerase activation during the human fibroblast immortalization process. Oncogene 18:4211. Groh, V., A. Steinle, S. Bauer, T. Spies. 1998. Recognition of stress-induced MHC molecules by intestinal epithelial γδ T cells. Science 279:1737. Parham, P., C. J. Barnstable, W. F. Bodmer. 1979. Use of a monoclonal antibody (W6/32) in structural studies of HLA-A, B, C, antigens. J. Immunol. 123:342. Brodsky, F. M., P. Parham. 1982. Monomorphic anti-HLA-A, B, C monoclonal antibodies detecting molecular subunits and combinatorial determinants. J. Immunol. 128:129. Kinsella, T. M., G. P. Nolan. 1996. Episomal vectors rapidly and stably produce high-titer recombinant retrovirus. Hum. Gene Ther. 7:1405. Valitieri, M., R. Schiro, C. Chelucci, B. Masella, U. Testa, I. Casella, E. Montesoro, G. Mariani, H. J. Hassan, C. Peschle. 1994. Efficient transfer of selectable and membrane reporter genes in hematopoietic progenitor and stem cells purified from human peripheral blood. Cancer Res. 54:4398. Wu, J., V. Groh, T. Spies. 2002. T cell antigen receptor engagement and specificity in the recognition of stress-inducible MHC class I-related chains by human epithelial γδ T cells. J. Immunol. 169:1236. Gilbert, M. J., S. R. Riddell, B. Plachter, P. D. Greenberg. 1996. Cytomegalovirus selectively blocks antigen processing and presentation of its immediate-early gene product. Nature 383:720. Bahram, S., M. Bresnahan, D. E. Geraghty, T. Spies. 1994. A second lineage of mammalian major histocompatibility complex class I genes. Proc. Natl. Acad. Sci. USA 91:6259. Machamer, C. E.. 1993. Targeting and retention of Golgi membrane proteins. Curr. Opin. Cell Biol. 5:606. Nilsson, T., G. Warren. 1994. Retention and retrieval in the endoplasmic reticulum and the Golgi apparatus. Curr. Opin. Cell Biol. 6:517.